I first heard of the Defeet Duragloves when Andrew Skurka included the wool gloves in his gear list for the Alaska-Yukon Expedition back in 2010. I was impressed that he chose to carry only one pair of seemingly thin gloves for all but the coldest portions of the trip. At the time I had an old pair of Outdoor Research PL 400 Gloves that I was happy with for winter backcountry use, but I kept the wool Duragloves in the back of my head as a possible replacement when the time came. I still have Outdoor Research PL 400 Gloves and I am still pleased with the warmth they provide for cold weather hiking, but I’ve never been satisfied with them on the bike. Even in cold temperatures, I always manage to work up a sweat when cranking on the pedals. The PL 400 gloves are just too warm for that application. This past October I decided to purchase a pair of the wool Duragloves to see if they would be better suited to fill that niche. 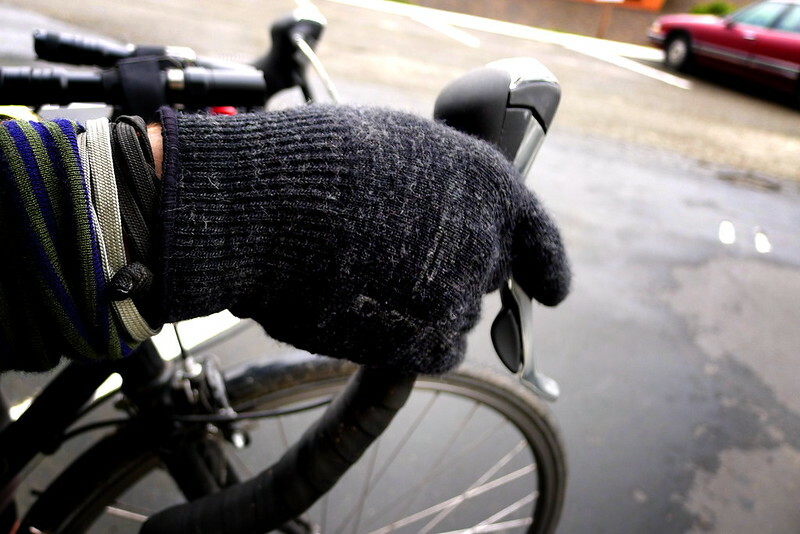 The wool Duragloves are a blend of 40% merino, 40% Cordura, and 20% Lycra. Their thickness is that of your typical liner glove. The palm and fingers are covered with rubber grippy things. My medium sized pair weigh exactly 2 oz. The gloves are designed specifically to address the problem that I was having. They are meant as a cool weather cycling glove that don’t cause your hands to overheat and sweat on hard hill climbs, but still keep you warm on the descent. Duragloves are not made to climb Mt. Everest. They are made to climb mountains at a hard pace, descend the other side, and do it over and over until your ride is done. Thin enough to ride at your maximum effort and still give you dexterity to fiddle around in your jersey for food. Thick enough to keep frostbite off your fingers at 50mph down alps still laden with snow. I’ve worn my pair on every commute for the past three months and can report that they do exactly what they claim to do. Temperatures this winter have been anywhere between 30° and 45° Fahrenheit and raining more often than not. Throughout it all the Duragloves have kept me warm and comfortable, even when wet, and I’ve never felt the desire to take them off to cool down. The thinness of the glove means that very little dexterity is lost. I do not need to remove the gloves to manipulate objects with my hands. I’ve had them for too short a time to comment on durability – and, until a crash, riding a bike tends to not be very demanding of a glove’s durability – but given the blend of wool and synthetic materials, I’m confident that the gloves will fully satisfy my demands in that department. 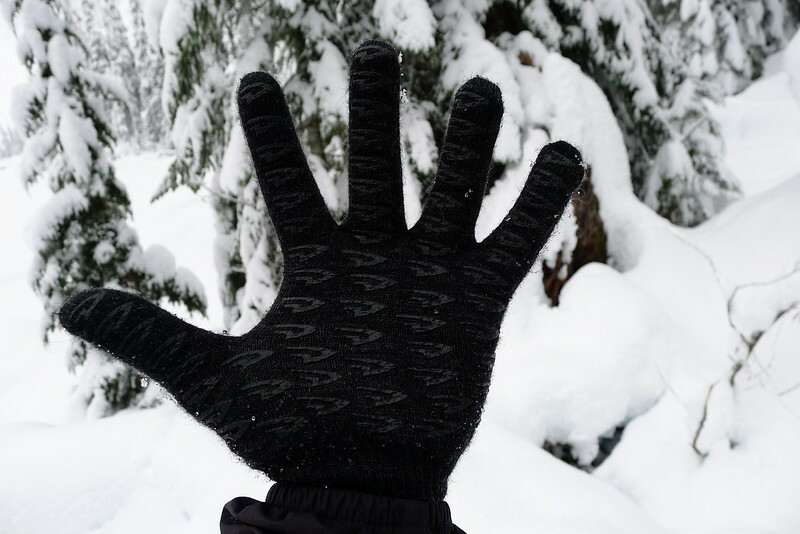 I have tried using the gloves on backcountry trips. I still prefer the Outdoor Research gloves for that application. 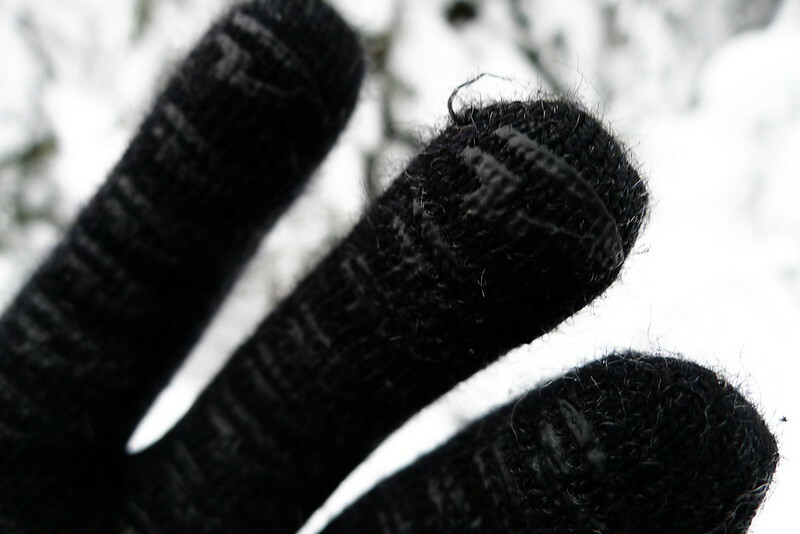 Walking does not consistently get my heart-rate up to the extent that riding a bike does, and the Duragloves are simply not warm enough to keep my hands comfortable during that activity. Used as a liner with an insulated mitten I’m sure they would be adequate, but I prefer to use a thicker glove with an uninsulated shell mitten. My only complaint concerning the Duragloves are the rubber grippy things. They could be grippier. When wearing the gloves it is difficult for me to twist the bezel of my Fenix LD20 headlights to adjust their mode. This is not the case on a more general-purpose glove, such as Mechanix gloves or Kuiu Guide Gloves. Even the grippy things on my Outdoor Research PL 400 gloves, despite having been worn down for years, do a better job adjusting the lights. I can work around the lack of grip (adjusting the lights is the only application where this has come up) and everything else about the gloves is close to perfect. They are an affordable, American-made glove intended for aerobic activity in cool conditions. If you’re looking for a glove in that department, the Duragloves are well worth your consideration. This post was published on 2012-12-30 . It was modified on 2012-12-30 . It was tagged with review, bicycle, gear.